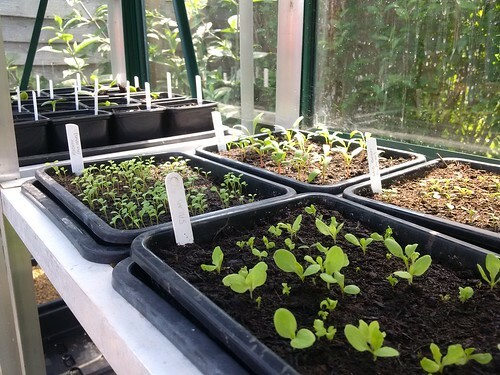 In the photo above, for example, are some of the ‘micro-leaf’ salads that I’ve been growing. They’re essentially nothing but normal cress, mustard, spinach, etc., that I pick as soon as the first leaves appear. But they taste so good. And they’re ready so quickly. 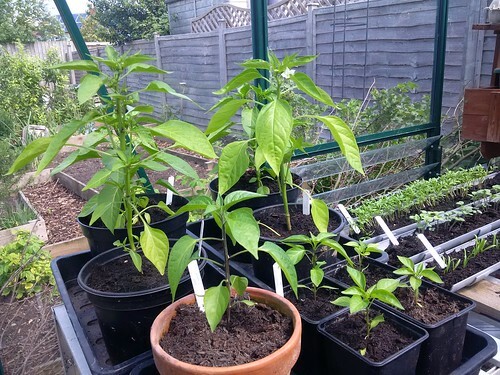 As you can probably see, I grow them in the greenhouse in lengths of guttering. Which makes me feel like I actually know what I’m doing. If only for a moment. Until I water them too violently and everything slides off the end. I do grow other things, though. 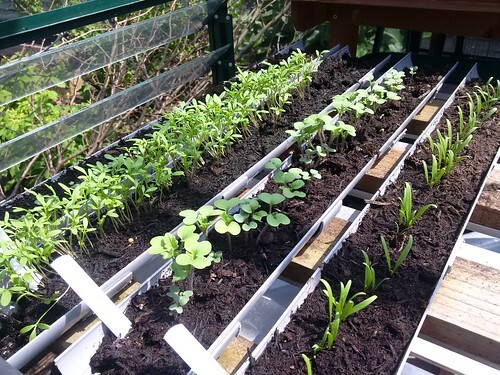 Here are some of the bean and pea shoots doing their thing. 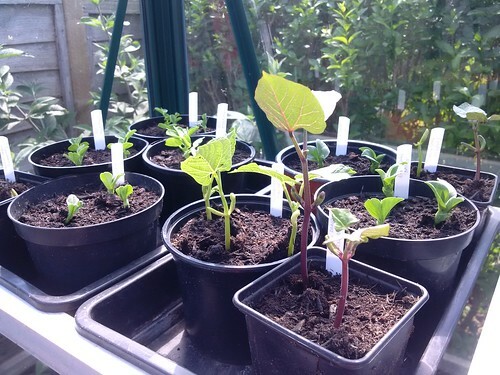 Now they’re growing well, I’ll harden them off in a cold frame and then plant them into the soil outside. We have lots of slugs here, so I like to give the plants a bit of a head start before I leave them to their own devices. If I sow seeds directly into the soil, they have a tendency to disappear without a trace. I planted my tomatoes at the same time as the chillis, and these are already doing really well. I have some tall-growing ones and some little bush-types, though for some reason I’ve put them all up against massive supports. No idea why, to be honest, but it stops me from bashing into the plants on my way into and out of the greenhouse, so I’ve left them there. There are even some tiny tomatoes starting to appear. Though this year I must remember to leave some of them for harvesting, rather than eating them all while I potter around the place and then having none for dinner. So that’s pretty much what’s going on around here. Though there are other things, too, such as garlic (planted at the beginning of the year and looking good), potatoes (planted a little late but almost ready to earth up), carrots (sown directly outside and just starting to appear), soft fruits (doing well), beetroot (in trays and getting ready to be planted out) and, of course, courgettes and squash (but a limited number this year, after the great courgette surplus of 2016). They’re all doing their bit. And, if I might say so myself, they appear to be doing it rather well. Here’s to microfarmers everywhere. 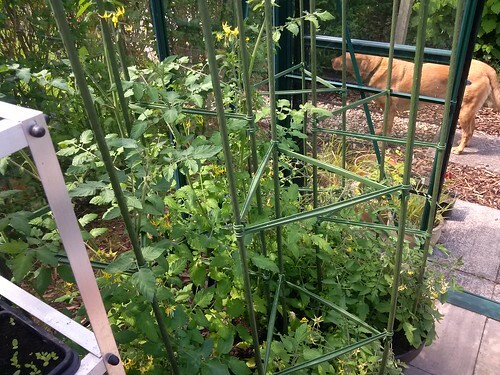 This entry was posted in Food, Gardening and tagged Gardening, Microfarm by Simon Perks. Bookmark the permalink.